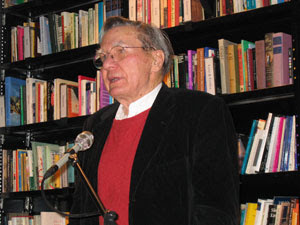 Galway Kinnell has been around for a long time. He's 83, and his first book was published in 1960, when he was 33. He has been a "serious" poet most of his career, addressing mortality, nature and environmental issues, war, poverty, marital disharmony, solitude--in the gravest possible tones. His indignation and grieving often rise to histrionic levels, and one has the feeling that it has always been important to his sense of self-esteem to be taken with complete sincerity. This is fine, up to a point. Formally, Kinnell has never been an innovator, which is to say that he has never seen fit to think far enough through the implications of how his art might reflect the utmost commitment he appears to make in the other spheres of his concerns. In other words, form isn't subject to the same level of inquiry he conducts with his emotions and official positions. Another New Englander, Robert Frost, was frequently amusing in his poems, using light, gentle ironies to gain access to deeper levels of meditation, than might have seemed apt, given the seemingly bland occasions of his subject matter. The grudgingly private and guarded Nor-'Easter's bearing was a persona Frost would often use to mask the philosophically astute and pondering mind that inspired many of his most impressive performances in verse. It could be tiresome, or arch, or too cute, at times; but Frost understood how levity balances seriousness in art, and comedy may be as ambitious a method as tragedy when it comes to the telling observation or unresolved dilemma. Yesterday morning, for instance, Keats told me about writing the "Ode to a Nightingale." He didn't offer the story of writing "To Autumn," I doubt if there is much of one. hours by hours," came to him while eating oatmeal alone. 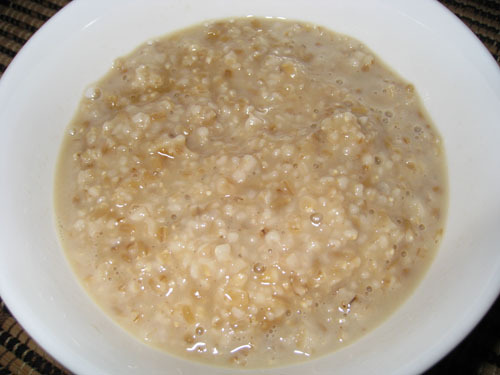 Oatmeal is the sort of poem that is very effective when read to groups. It has just the right light-hearted tone, a dramatic whimsy which captivates peoples' interest in a public setting. I've never heard Kinnell read it, but I did hear him read his poetry, twice, back the early 1970's, and he was very effective, with a breathy baritone which seemed to command attention. Oatmeal is a classic anthology-piece, inviting and ingratiating, but it's very untypical of Kinnell's work as a whole, employing as it does elements of fantasy and humor which belie his usual gravity and conviction. I suppose one could say it's a kind of writing he's "earned" the right to enjoy through the course of a long, honored career. The idea of making up an imaginary conversation with John Keats over a bowl of morning oatmeal is the sort of gesture you might expect of Ogden Nash, or James Thurber. Having Keats mull over his composition of "Ode to a Nightingale" in his characteristic Cockney accent is the sort of clever detail that would charm the casual poetaster. Two details seem somewhat out of place, though, or perhaps they're examples of Kinnell's contribution to the imaginary history of literary biography. Somehow I doubt whether Keats would be comfortable with the simile of "the way here and there a line will go into the configuration of a Moslem at prayer, then raise itself up and peer about, and then lay itself down slightly off the mark"; or the remark about "amnion's tatters." Amnion is the thin, tough, membranous serous-filled sac that encloses the embryo or fetus of a mammal, bird or reptile. "Amnion's tatters" is the sort of slightly yucky detail that is characteristic Kinnell. That oatmeal should evoke associations like this is the sort of standard grim connection that drives his imaginative engine. 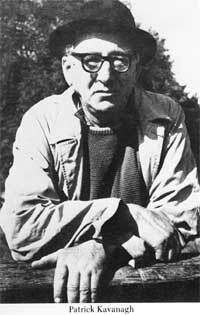 The poem concludes with a humorous aside about the Irish potato connection of Patrick Kavanagh:"I am aware that a leftover baked potato is damp, slippery, and simultaneously gummy and crumbly, and therefore I'm going to invite Patrick Kavanagh to join me." Irish poet Patrick Kavanagh was safe in his grave long before Kinnell put him into this poem, so the conversation with the dead conceit is preserved. I think it's encouraging to see a fee-fie-fo-fum poet like Kinnell let his hair down, occasionally, and write a poem of simple charm, even when it's thinly disguised free-verse doggerel like this. Allowing oneself to step out of the robes of high aesthetic discourse and speak commonly is always a useful exercise. Pound often did it, to great effect, and his mixture of rude frankness with high toned address is one of the strengths of Modernist art. For most of his career, Kinnell walked the typical tight-rope of maintaining the modicum of decorum while speaking--more or less--in the vulgar tongue. He never ascended to the kind of strained prosaic intensity of Jack Gilbert, James Wright, though one senses that he was just as ambitious and committed to that intensity of potential effect as they were. Kinnell has a devoted following, and it's easy to see why. He puts out a controlled, clean line of measured positions, strongly male; his opinions are predictably correct, and he projects the loner's romantic code of individuality and crusty disdain. I have admired a number of his poems, though they ultimately present no challenges to poetic formality, or prevailing political conceits or presumptions. There is a level of ambivalent complacence about this which is distinctly un-contemporary. And Oatmeal seems to capture some of this tension, between the immediate reality of daily life (eating breakfast alone), and his aspiration to connect with the larger tradition that inspired his earliest efforts. Perhaps Kinnell had realized, at some point late in the game, that it was his differences and privacies and incidental oddnesses that would, in the end, save his name from the obscurity of the quotidian, from the predictable niceties of the day. Kavanaugh and the Irish potato famine. Very funny, I guess. Geez, I really didn't like Merwin's work much, and this soggy mess really leaves a lump in my stomach. People who don't write very well in the first place can't handle comedy at all. Collins would have done a much better job with this poem. This is Merwin attempting to do a Collins? He should stick with bones and stones and scones. 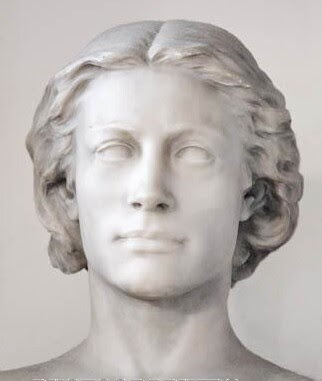 I would have thought that Milton would be a good fit for you--filled with righteous Puritanical injunctions, the sturm und drang of the battle for men's souls. Kinnell is among the best of the traditional second-generation post-War group. A contemporary of Merwin (they both went to Princeton at about the same time), but the similarities (IMO) end there. I had a brief fling with Merwin during the late 1960's (his Moving Target and Lice period), then quickly tired of him. He's a dogged poet, with thousands of pages of published verse behind him. I think he wrote way too much. Kinnell's different, but as I note, a fairly humorless writer. Some people think of humor as cheap emotion, not worth trying. In really good poetry, humor and tragedy are bound up together, and tussle. The Jewish writers are the best in this regard. The music of cynical, dry amusement. Malamud and Bellow, Roth and Heller, Singer and Doctorow. Gotta love'em. The poem is prosaic, almost completely "un"-poetic. I would have thought that would appeal to you, too, Kirby. Lack of pretense seems one of your priorities. I prefer Suckling to Milton. I love Suckling. I hate Milton. ¿Donde esta mi escribiendo, CF? This is your blog, of course, but the authentic lover of liberty and free expression should avoid screening comments, I believe. My blog was unmoderated/unscreened for 3-4 years, and I received numerous death threats (from both left and right wingnuts) along with the usual obscene insults and ugly peasant rants, and then I reluctantly decided to moderate for a year or so. A few months ago, I decided to remove the moderation screening, and the captcha crap--and traffic increased substantially (and Blogger now catches nearly all the spam). Any nasty or hick-like comments you aren't around to stop can be easily deleted later. That's authentic BeatGen blogging (unlike say KO's site, or S-man, which is inauthentic, non-BeatGen Foxnews era pseudo-blogging). Allowing oneself to step out of the robes of high aesthetic discourse and speak commonly is always a useful exercise. Pound often did it, to great effect, and his mixture of rude frankness with high toned address is one of the strengths of Modernist art. Yes, but....Kinnell's Oatmeal sermon seems nearly diametrically opposed to the Poundian ethos. Re-reading it, I sense it's nearly a ...WASP manifesto of sorts. He scrawled it in the 60s, right--perhaps as a sly commentary on Le Gauche--not only contra say ML Kings and hippies, but Che Guevaras, and Pablo Nerudas, Sartres and Bretons, etc. Sort of God save the Queen, in vers libre. I didn't suggest (did I?) that Kinnell's poem was like Pound, or that Pound would have approved of this poem. I merely meant to suggest that mixing low and high mimetic was a recipe for a more vigorous aesthetic, at least in the reading. Pound's dislike of Victorian pieties is well-documented (by himself). The Kinnell poem is atypical of him, and I thought it useful to point out why it stood out among his other poetic output, and why it might be considered preferable. I like it ...not--though Kinnell's a talented bloke, sort of. No, you didn't say Kinnell was Pound-like, but hinted at it maybe. My own sense is that literature of the high sort--Pound, Eliot, Joyce, etc---has more or less disappeared. Most humans simply don't posssess the requisite classical knowledge, latin, greek, history, metaphysics, etc. Perhaps a few altar boy catholics do (and europeans, at least the wealthy sort), but that's not the typical WASP (meself included. Im aiming for like Hemingway-like prose. Or maybe Dash Hammett. Or Mickey Spillane at least). The lit. business now has been taken over--I won't say by whom, but....they're not Pounds or Eliots, but the sort of creatures that Silliman discusses.